Petra’s Marketing strategy is based on an active collaboration between our staff and consumers that enjoy our products. Flour is often seen as an easily interchangeable ingredient. People use inexpensive and anonymous flours in their bakery products because they believe that the choice of a cheap flour will not influence the end result. Nothing could be further from the truth. Using the wrong bakery techniques and saving money on flour can lead to a mediocre result, a waste of money and time. Marketing is a widespread English word, commonly used in Romance languages. It clearly refers to the term “market” and the -ing form expresses an idea of action and movement. This term reflects the active attitude needed by a company to promote and sell its products and be competitive on the market. Petra focuses its marketing strategy on the quality of product. The reputation or notoriety of the baker are not important because the results will speak for themselves. In order to achieve top quality bakery products the choice of the right type of flour is essential. Flour is a simple and common ingredient, but it makes all the difference. 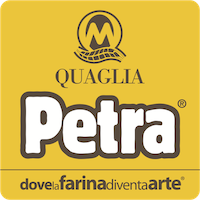 Petra’s marketing strategy emphasizes the importance of a careful choice of flour, promoting only the highest quality ingredients. We organize different kinds of events in the old Molino Quaglia building and all over Italy. We want to promote our Petra Selected Partners, as well as meet new customers. We organize technical demonstrations to share our knowledge. We do not simply promote our products, we want to collaborate with different people in order to create memorable experiences. We search the web to find all the articles, images or posts on Social Media related to Petra and our Petra Selected Partners and we make them easily accessible to our readers. You can find the link to the original source at the end of each article. Flour is an active and rich ingredient and needs to be handled with care in order to preserve its quality in doughs and baked products. We use state-of-the-art technologies in order to produce a flour that is stable over time. However, it is important to control the interaction between Petra, the water, the temperature, the yeast and the heat in order to bake perfect products. Hence, the idea of organizing technical demonstrations in different Italian cities. Petra’s G’trainers can help food professionals improve their baking skills. According to ISTAT( The Italian National Statistical Institute), in 2013 almost 10% of Italian adult population was suffering from obesity. This means that almost 6.000.000 Italian citizens were overweight due to an unhealthy diet and a sedentary lifestyle. To help tackle this situation, Petra launched the REBUILD YOUR FOOD campaign to increase awareness on the correct carbohydrate intake and the benefits of an active lifestyle. Petra communicates on Social Media to reach its customers and share messages, information, pictures, videos and news with them. We want to create an open dialogue with all the people that use our products. For this reason, you can chat with us using our Messenger chat-box on the website. Flour and Fire is a documentary on Contemporary Italian Pizza directed by Silvia Chiodin. Francesca Romana Barerini interviews pizza makers, university professors and technological experts in order to discover how a gourmet pizza is made. Stories and interviews of 60 pizza makers that will teach you the secrets of pizza. Art is the expression of human creativity and aesthetics. It is created through talent, training and experience and it has the power to convey emotions, messages and values. Similarly, specific techniques and skills need to be used in order to transform flour into food. And to obtain good food you need to transform your experiences into knowledge. Skilled hands and technical knowledge will make the flour a useful and valuable ingredient. Passion and aesthetic sensibility transform flour into a form of art. FUORI (Italian for outside) is Petra’s publishing project. The magazine is registered in Milan (n.160 on 11 May 2017) and has become a tool allowing food lovers as well as professionals to discover new ideas, experiences and products. There is also an online blog edited by the journalist Cristina Viggè. She uses her unique point of view to comment on food, gastronomy and lifestyle. She reports on what happens all around Petra’s world.